A unique regional tea from Yunnan Province, China. 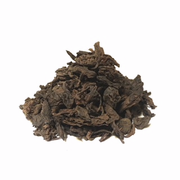 Aged loose leaf Pu-Erh tea with a earthy aroma. A smooth tasting tea with a deep amber color brew.